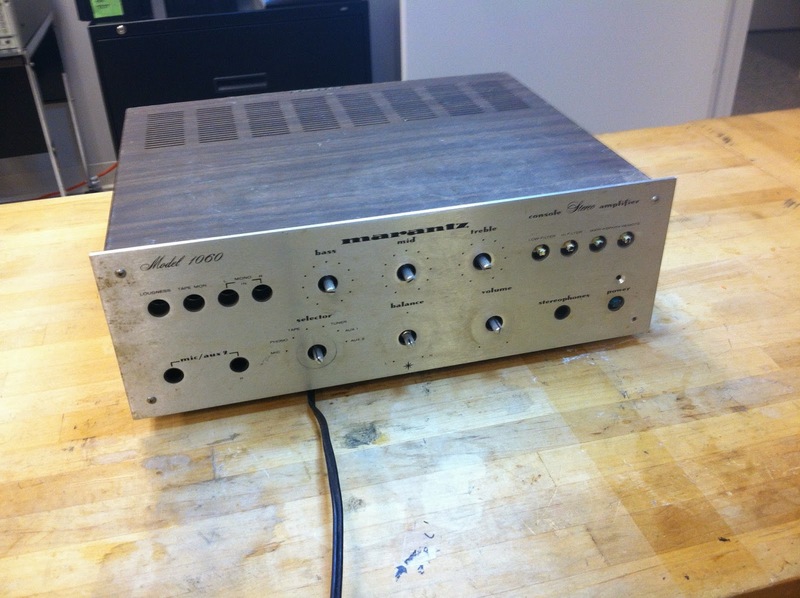 When I was a teenager my dad lent me his Marantz 1060 amplifier. 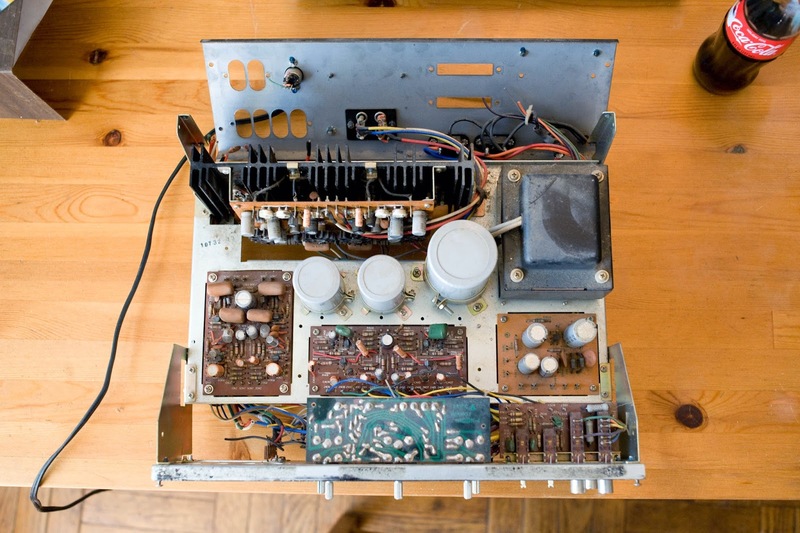 The 1060 was the centerpiece of his first stereo system, purchased in 1971 when he was 20 years old. I used it to play the Beatles' "Revolver" over and over until one day the amp quit. I can't remember what the symptoms were, but I know that shortly thereafter my curiosity got the best of me and I tore the amp apart. 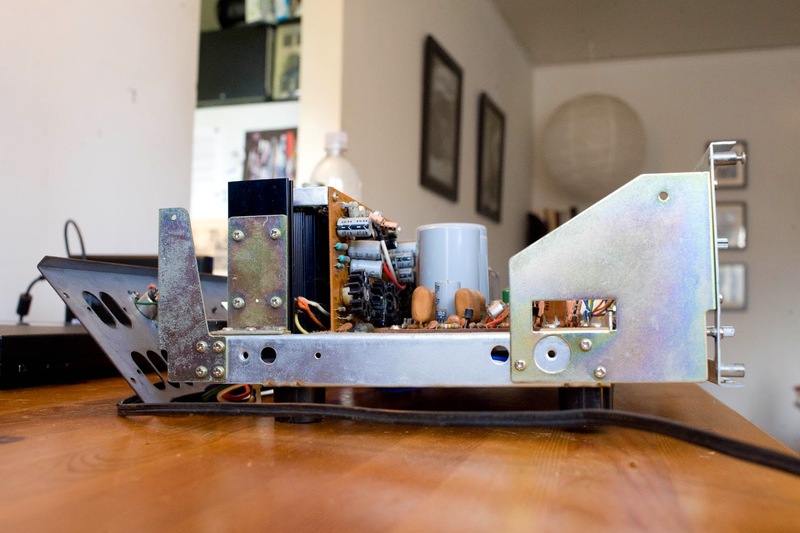 I robbed many of its guts to make a speaker switch that I didn't really need. A short while later I received a plastic boombox for my birthday, and what was left of the 1060 was packed away. I decided it was time to undo some of the destructiveness of my youth and restore this classic to its original condition. 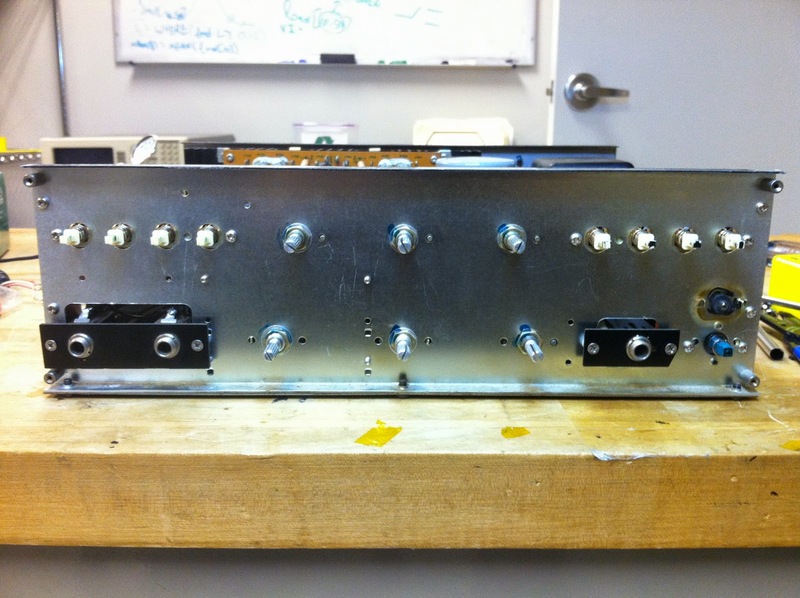 When I got the amp home, I took a few more photos to show what shape it was in. 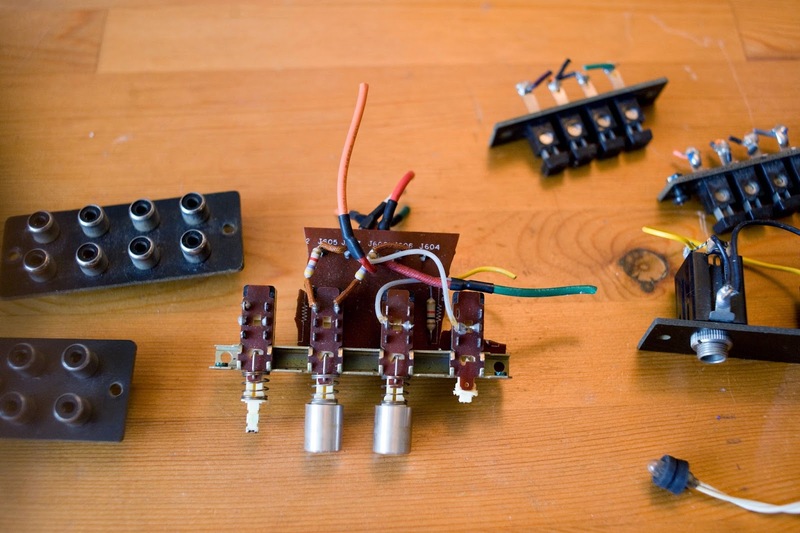 The mic/aux jacks, headphone jack, speaker terminals, left quad switch circuit board, input RCA jacks, tape RCA jacks, and lamp had been removed. The fuse holder, four of the switch caps, and the blue lamp jewel were all missing. 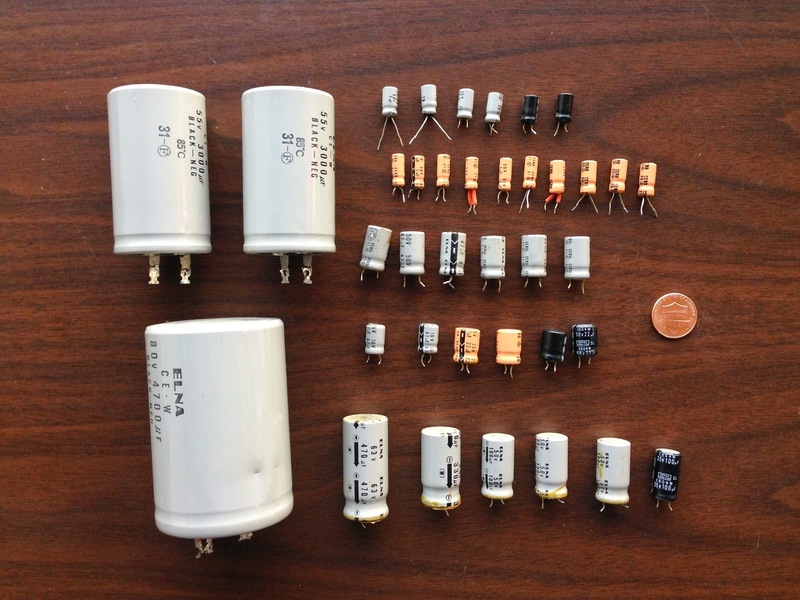 Here is a photo of one of the large power supply caps and its replacement, to show how dramatically cap sizes have decreased over the last 50 years. I had to wrap some foam around the new cap to make it fit in its holder. Once the recap was done, it was time to power up and find out where things stood. 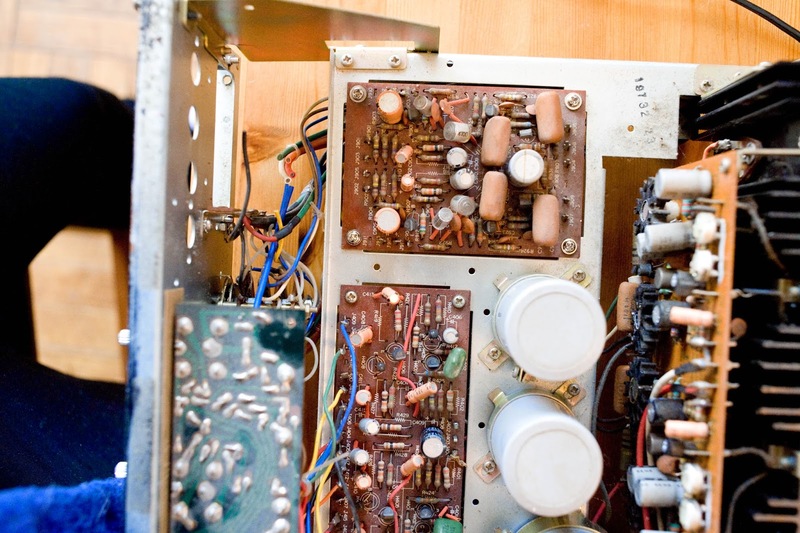 When powering up electronics that are in questionable condition, it's a good idea to slowly increase the power applied. 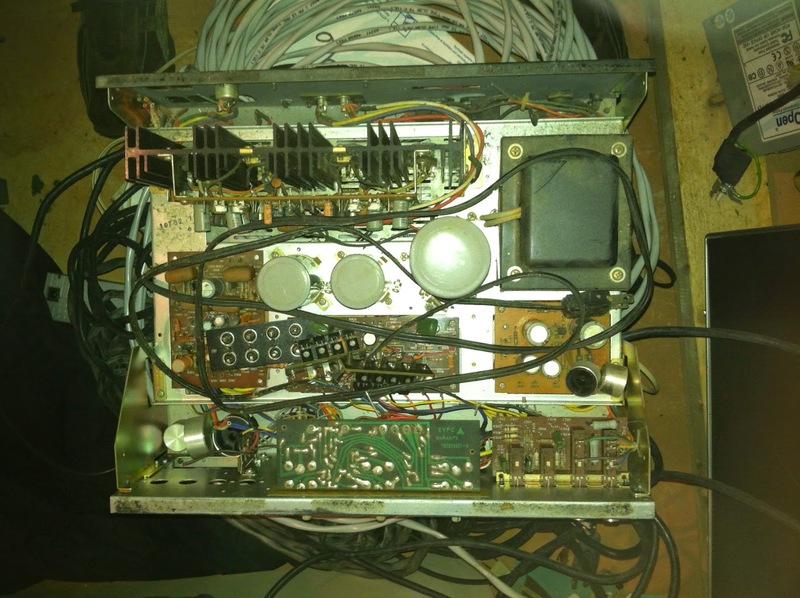 This way if any of the components inside are drawing more current than they should be, you can catch the problem without causing even more damage. Variacs are commonly used for this purpose, but I don't have one, so I made a dim bulb tester. The 1060 passed the power-up test with flying colors, and I was able to plug it into the wall. With the unit safely powered, I performed the "maximum power output" test listed in the service manual. This test confirms that each channel is capable of delivering 30W to its load (typically a speaker) at its maximum input level. 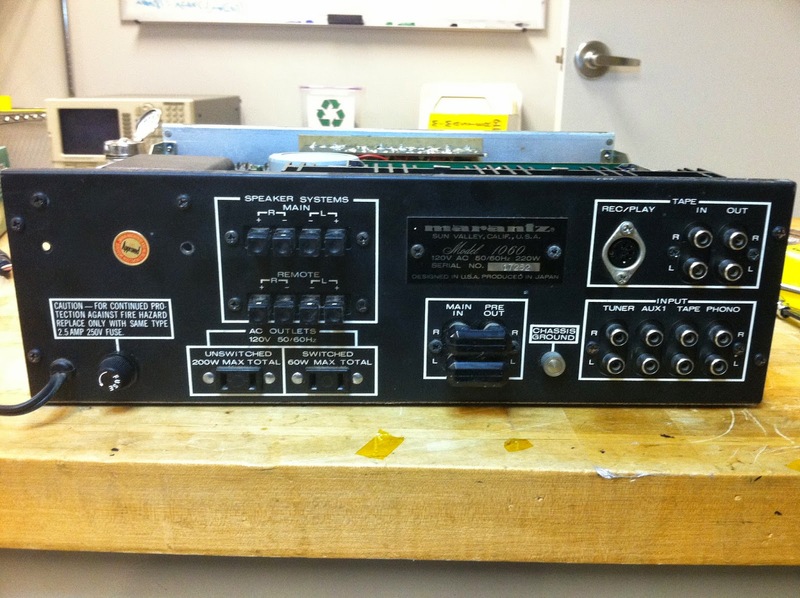 After that, I hooked up a function generator to the input and a sacrificial speaker to the output. Everything sounded good. I took a look at the output with an oscilloscope and the waveform looked nice and smooth. 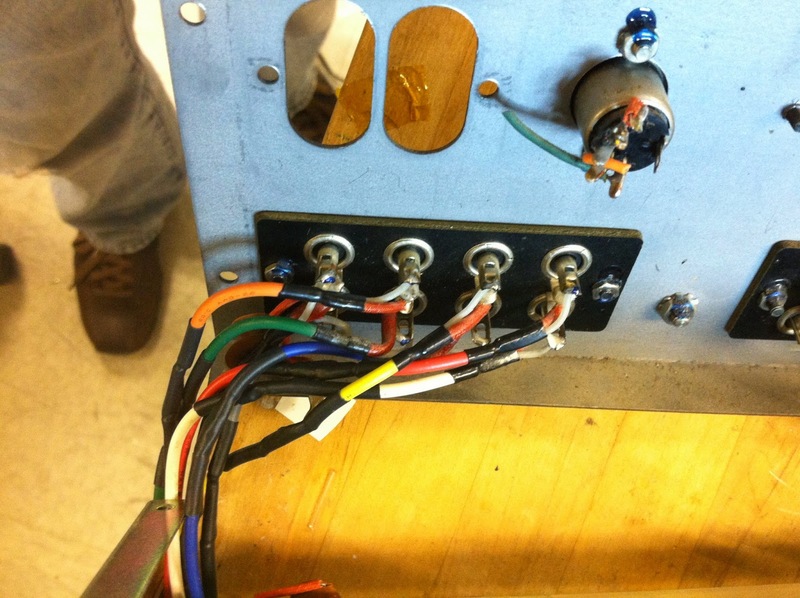 I tested all the inputs, outputs, and controls and everything seemed to operate normally. Perhaps one of the caps I replaced had caused the amp to fail years ago. I'm sorry to say I did not perform any further analysis to test noise floor, frequency response, or distortion. An honest-to-goodness restoration would require these tests. 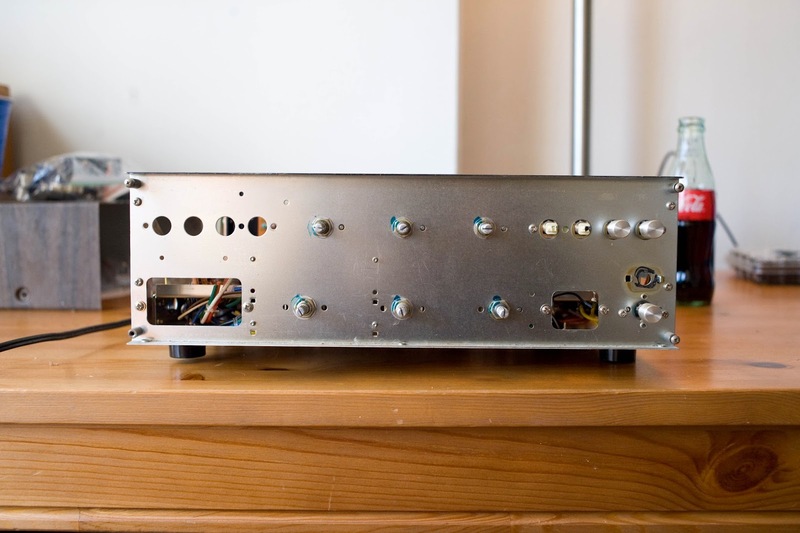 I was more interested in getting the amp in reasonable working condition than making sure it perfectly matched its original spec. Maybe one day I will go back and perform these tests for my peace of mind. 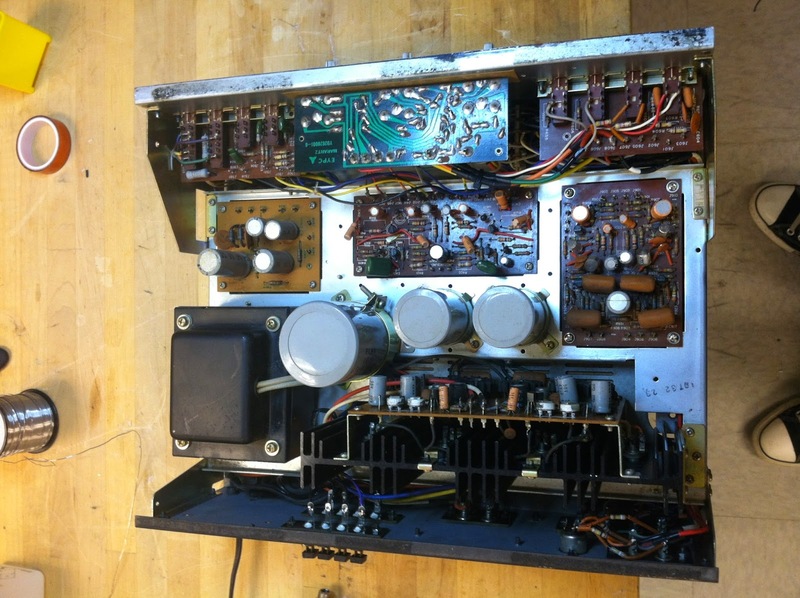 The final step was cosmetic restoration. The faceplate was very dirty. I read a lot of online forums and determined that the most popular products for cleaning aluminum faceplates were Windex, dish soap, Blue Magic metal polish, and Simple Green. I tried all of these. They did a decent job, but the best performer was actually a Magic Eraser (which I was careful not to use on the screen printing). I performed a few other minor repairs such as replacing missing hardware and fixing one of the plastic feet with some Gorilla Glue. I found OEM replacements for the missing switch caps on eBay, but they were exorbitantly expensive (~$10 per cap). I kept looking and found some almost identical caps from China that were $8 for a pack of 10. I replaced all the original caps with the Chinese ones and I think the overall look is nice and similar to the original. The cost of the entire job, including components and cleaning products, was $106. Fortunately the generous eBay seller who sold me parts included a bunch of stuff I didn't need, which I was able to resell on eBay and bring my total cost down to $58. I still have some parts left to sell so I might be able to get that down even further. I have no idea how many hours the project took me; I worked on it sporadically from February of 2013 to October of 2014. Since I finished the amp in the Fall, I wrapped it up and put it under the tree for my dad this Christmas. He was very happy to receive it, and we hooked it up in his system on Christmas morning. I was surprised by how much better it sounded than his 90's-era Kenwood receiver. Warm, clean, crisp, beautiful tones. I was delighted with how the project turned out. The good photos are courtesy of Erin Scott Photography. That was very fun to read and you did a great restoration job! I'll bet that your Dad was very happy! 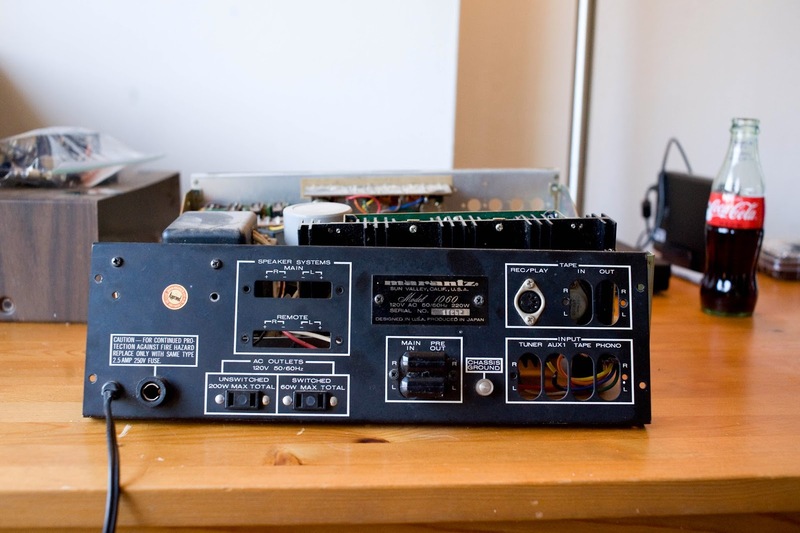 I've the same 1060 Marantz and lately the power indicator lamp does not light up. Everything else is working so I suppose is just the lamp itself. You have wrote that you replaced it with a LED. Could you share what kind of LED (model/number) and if is straightforward or needs some tweaking? Thank you for this article. Great Job! Thanks, warztat. You can use any standard, 5mm LED. White is best to shine through the blue jewel. Here is one that would work. For this LED, that would be (8-3.2)/0.02 = 240 ohms. Luckily that's a standard resistor value. Power is equal to voltage * current, so the resistor's power will be (8-3.2)*0.02 = 0.096W. So a 1/8W would work, but I'd probably go with a 1/4W. What I did was remove the rubber grommet from around the lamp with an exacto knife and super-glued it to my LED. That way it fits in the hole snugly. Hope this helps! Good luck with your 1060! So did you do anything with power output section? Just replaced the caps on the spreadsheet list? I replaced all the electrolytic caps, including the ones in the power section. But I didn't do any more than that. Consider, for the filter caps, replace the cap with the same size cap to fit the legacy clamps. The cap value will be much higher which for that part of the circuit is bonus. Nice job.